When Milwaukee Brewers Catcher Jonathan Lucroy decided to put the Detroit Tigers on one of his eight teams list he'd veto a trade, I doubt that GM Al Avila was losing any sleep over this. First of all, Avila would have to deal prospects to get a guy that would last a year and a half before hitting free agency, thus this would risk mortgaging the future. 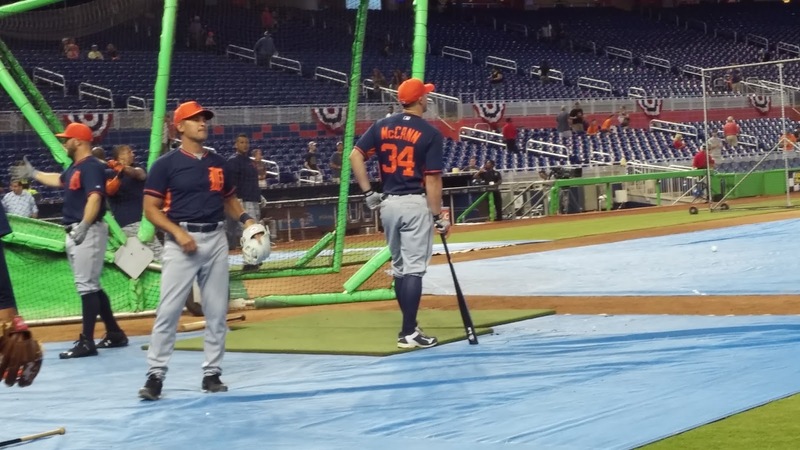 Is current Tigers Catcher James McCann an All-Star back stopper? If you judge his offensive stats the answer would be no. The Santa Barbara, CA native has a career average of .244 with 14 HR and 68 RBI. In 2016, he's hitting .204 with eight HR and 31 RBI. 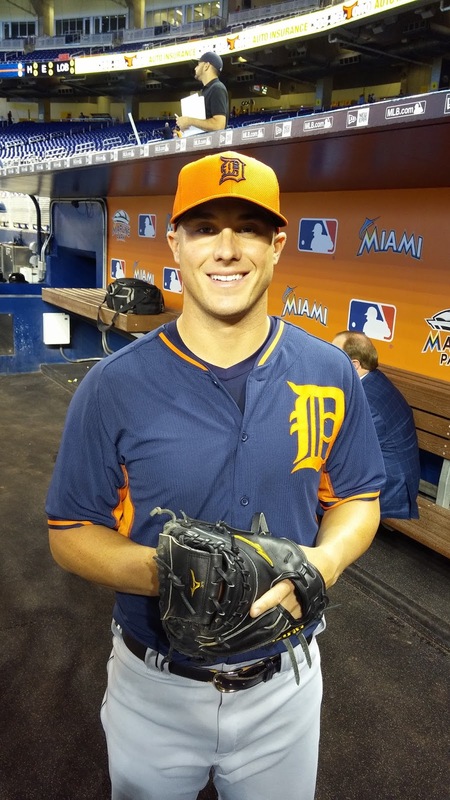 On Sunday, the 6-2, 210, 26-year-old belted a grand slam to lead the Tigers to an 11-0 thrashing over the Houston Astros at Comerica Park. 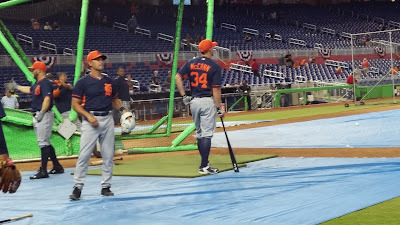 But defensively, McCann, is rock solid and he's well respected by his pitchers. When the Tigers faced the Miami Marlins in South Florida during their opening series, I had the chance to catch up with the catcher and we had a nice conversation. Q: What did you learn from your first season that will carry over to your second campaign? A: The one thing that you can't replace at this level is experience. You can play as much as you want in the Minor Leagues, get as much reps as you want, but it's really the stuff at the big league level that counts, and definitely helps, plus more of a comfort level. You understand how long the season is and not fret over the little things. That goes a long way as experience. Q: Let's talk about the pitching staff. What was your first year like handling one at the big league level? A: I've learned a lot more about them. We have a great pitching staff and great guys. They like to talk baseball and it makes it easier to get to know the guys. You get to know what they like to do. I've enjoyed getting to know the new guys on the staff. Q: What's it like catching Justin Verlander (11-6)? A: He's a great guy. He works his tail off. He leaves nothing uncovered. He's always looking at the scouting reports on every little thing that he can uncover to get an edge. He's a guy you can learn from. Q: The Tigers found their closer in Francisco Rodriguez (29 saves). How much did you like that acquisition? A: It was good. I've been watching him as a kid. His success on the field speaks for itself. He knows the game like nobody else. He's extremely good at what he does. Q: Finally, your Manager Brad Ausmus was a former catcher. What have you learned from him? A: Brad Ausmus has had a lot to offer. He played the position 18 years in the big leagues and gives me a lot of great information. As the trade deadline approaches, I wouldn't be surprised to see the Tigers bolster their pitching staff as long as it doesn't cost them an elite prospect. The team will get a boost when Jordan Zimmermann (9-4) returns to the starting rotation. J.D Martinez (.286, 12 HR and 39 RBI) should be a welcome addition to the Tigers, who are now 57-48 and are in playoff contention. Meanwhile, thanks to Lucroy, the Tigers best decision is the one they may not have to make and that's sticking with McCann for the rest of the year. Scott Morganroth can be reached at www.scottsports33.com and he's a member of the Detroit Sports Broadcasters Association.